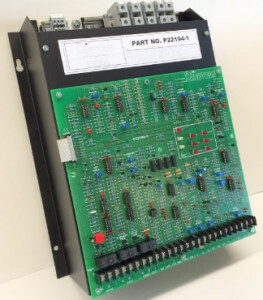 The P22194-1 is a non-regenerative D.C. motor control providing full range speed and torque control of 5-20 HP D.C. motors rated for NEMA type “C” and “D” power supplies. It is rated for operation on 208-230 VAC 3PH lines and will supply a variable armature voltage up to 240 VDC and a selectable fixed field output of 150, 240, or 300 VDC. A semiconductor fuse is provided for armature protection. Also provided is fuse protection for the 230 VAC control voltage input. Standard logic interfaces with customer supplied operators for Start, Stop, Jog, Override Stop, and Reset functions.